As a business owner, the exterior of your proprietorship is important to the look and feel of your business. When you are considering asphalt parking lot installation, or if yours is in need of asphalt repair, choosing the right company for the job is important in ensuring that your parking lot will stand up to the elements. In Waco and Temple, TX, asphalt repair or new installation can be necessary due to the high traffic. When you need parking lot service, call our experts to complete your project quickly and reliably. Call 254-716-8685 to set up your consultation today. The installation of a new asphalt parking lot can seem overwhelming. Our professionals walk you through the process, explaining material advantages and costs as well as explaining procedures and work timelines so you are always in the loop. We complete your installation at your convenience and work quickly and efficiently to provide a strong, durable parking lot without interrupting your business. Our experts properly prep, lay, and pack your asphalt parking lot to ensure a firm foundation that resists alligator cracks, potholes, and raveling. We can also finish out your parking lot with code regulated striping and handicap line painting for a flawless, bright asphalt parking lot. Give us a call today when you need asphalt installation or asphalt repair in Waco and Temple, TX. As time goes by, your asphalt parking lot can begin to deteriorate causing potholes, alligator cracks, and even raveling throughout the area. Our team of professionals can assess your parking lot and offer realistic repair solutions that fit every budget and time frame. We maintain full transparency in regards to the performance and cost associated with our services, so you can make the best choice for your company. We will complete your repairs quickly and comprehensively to help prevent future problems in your system. Don't let a worn parking lot drive away your business. For an immediate boost to the appeal of your storefront, count on the impact of a new parking lot. 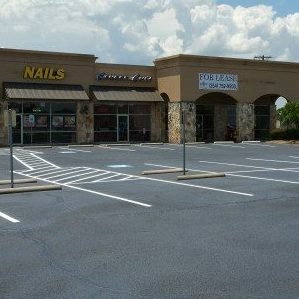 A new or repaired parking lot can substantially improve the look and feel of your business’ exterior. When your business could use a pick-me-up, asphalt repair or installation in Waco and Temple, TX may be just what you’re looking for. Call our experts today at 254-716-8685 to schedule your evaluation and get your project rolling now. We Offer other asphalt services like asphalt overlay and asphalt driveway installation, so contact if you are needing those services, as well. Updated on April 2, 2019 at 4:29 pm by eSquared Asphalt Maintenance.